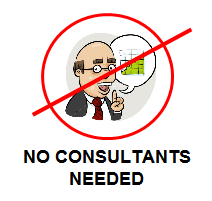 I have a professional lifelong aversion to consultants. But, now I is one! How to reconcile these two polar opposites? Make Work: Rather than solve problems for me, they made more work for me. They always seemed to come up with tasks I needed to undertake, as if they were the teacher giving me an unwanted additional homework assignment. Credibility: Did they have really credible experience doing what they were advising me to do? Advice is a dime a dozen, but were they really speaking from personal professional experience? Or, were they just “talking a good game” and, like many a substitute teacher, just a lesson or two ahead of the class? No Ownership: They were awfully expensive, and when they blew into town, they did their thing and then left – whether or not the results had been accomplished. They didn’t own the problem as I did. Ongoing: Or, worse, they sought an ongoing consultancy with a substantial monthly retainer. Their work plans often weren’t clear, and ongoing management of them required a large investment of my time. The economy, stupid. I have just laid off staff or face staffing cutbacks. How can I honorably hire a consultant while laying off staff? I am sure there are more – just get me going over a drink. Or, better yet, add your own reasons. So, now that I am a consultant, how to I deal with these objections? Well, I have to admit, the broad brush condemnation of all consultants is unwarranted. The biggest problem, I suspect, isn’t them – but rather, how we use them and what we expect of them. Here are some things I think are a good use of consultants. You have a particular, well-defined task that needs to be accomplished and it can be outsourced to a knowledgeable person. Getting it done this way really will help you, and the consultant is a self-starter — motivated, professional and mature enough to manage him/herself. You are down staff (layoffs, resignations, etc.) but the work still needs to get done. How can you farm some of it out at a reasonable, predictable price that is within your budget? You decide what it is worth to you, and the consultant decides if he/she can do it for that price. You need to conduct a staff learning or training exercise, and while you could do it yourself, you face two obstacles: (a) Your staff has heard you say this stuff before and they don’t pay special attention anymore; (b) A consultant who is a specialist and does this training for a living will have the exercise organized and designed into a focused activity. You need to do a one-time exercise, like a CPB application, and you want someone who knows exactly what the drill is and how to walk you and your staff through the steps in the most efficient and painless way possible. Finally, the economy. Hard as it is to do, layoffs and staff cutbacks may be necessary if your shop can’t afford an ongoing salary and benefits. But, if the work still needs to get done, can you actually save money by working with an outside contractor and not paying continuously for a staffer plus benefits. Again, I am sure there are lots more good reasons. I’d like to hear both the bad and the good from you. Let me know at [email protected]. And let me know too if there’s anything you like to talk with me about. My associates and I are ready to help you determine if a consultant can help you, and who might be best to meet your needs. This entry was posted in Articles & Musings on October 31, 2013 by Jim Russell.